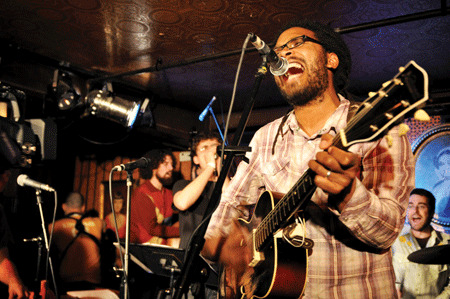 Formed in 2002, the Woes have been delivering their brand of dust-belt folk music to an every-growing NYC audience. At times the group can resemble a chaotic collective, but the discerning fan can pick out the regulars, including Jesse Lauter, Cicero Jones and lead singer/songwriter Osei Essed. In Essed, the Woes have the catalyst for what few bands can boast: genuine, visceral attitude. His voice delivers the deep sound of Tom Waits with the spiritual, gothic Americana sound of David Eugene Edwards. 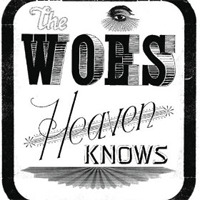 Their new CD is entitled “Heaven Knows” and they are currently touring behind it. Essed took the time to answer questions from the road. Deli: With such a large rotating cast of players, how did you approach the sound for "Heaven Knows?" How much/little do the various members contribute to the approach? Osei: At the time when we started recording Heaven Knows we were pretty new to this way of making music happen. That is to say there were a lot of people consistently playing with the group, but there were at least as many who were only there every once in a great while, truth be told it was a bit overwhelming. Most of the songs had already been played with various configurations of the group, and when in the studio Cicero, Jesse and I figured out which songs sounded best with which instruments before recording them. Deli: Lyrically, your material contains a lot of classic Americana imagery that works familiarly with the arrangements. When you write your songs, do you find you are able to convey yourself entirely within this lyrical/sonic framework? Are there songs that "don't fit" for the Woes? Osei: I write all the time, and lots of the songs I write don't really work with The Woes. The songs that do end up in the repertoire. There is a whole group of secular gospel songs that I wrote a few years back and was playing under the name "Baines Family Revival" with just myself and Emma Mae & Kate Mikulak singing them. I'm working on a set of songs now that I'm writing based on repetitive rhythmic figures and lyrically will be based on a group of phrases that somehow worked their way into my head. Deli: You're touring behind this record. What's your touring group like compared with your shows in NYC? Osei: Our New York shows have been pretty special, since just about everyone involved lives in the area. We've done shows with 20 people and shows with 3. The last year we've most often played with between 7-14 musicians. The touring group has varied in size between 4-7. Seven seems the ideal number for the road, but we've only done one tour that way so far. Deli: Who/what are some influences on your music that may not be obvious to the listener? Osei: Influences are difficult to trace. There is very little music we do not listen to, and I'm rather certain that everything we've ever heard whether we like it or not finds it's way into the music we make in some way or other. Today we drove from one end of Tennessee to another, we listened to a ton of Gamelan music and some John Zorn and The Basement tapes as well as the Blues and Ballads record from the Ethiopiques collection. Deli: What do you hope people walk away with after hearing a live Woes show? How would you hope your audience feels? Have their reactions to your music every surprised you? Osei: Of course we hope that the people who come to our shows leave feeling that they've danced a little in their heads if not with their bodies, and if they're more into listening to the words, I hope that I've written about an emotional landscape they're familiar with, or about a place they'd like to be. We once played a middle school in Starrett City during an assembly on the last day of the school year, right after a 30 minute Kung Fu demonstration. There were about 500 adolescents crammed into a gymnasium. From the first sound I made with my voice pandemonium broke out, all the kids screaming, some laughing, all of them completely shocked that what we were doing was music at all, it was pretty funny and certainly memorable. "Of course we hope that the people who come to our shows leave feeling that they've danced a little in their heads if not with their bodies, and if they're more into listening to the words, I hope that I've written about an emotional landscape they're familiar with, or about a place they'd like to be." Rocking Gospel with genuine, visceral attitude.